The RMS Olympic was one of two sister ships—along with the HMHS Britannic—to the ill-fated RMS Titanic. She was the first of the three to launch in 1910 and soon went into service in the First World War, remaining in service until 1935. The Olympic's First Class Lounge was later removed and now serves as a restaurant yet again, this time in an Alnwick hotel. When she was auctioned off and made her final voyage up the Tyne River to Jarrow in 1936, she was stripped of her dining room. A local hotelier, Mr. Algenon Smart, successfully bid on the original oak wood paneling, stained glass windows, mirrors, and ceiling from the First Class Lounge, along with its revolving door and the Aft First Class Staircase. He installed these features, nearly identical to the Titanic's dining room attributes (they were both designed and fitted by the same team of craftsmen at nearly the same time), in the White Swan Hotel where they've remained since. As you enter the hotel, you pass through the original revolving door used on the Olympic to keep sea breezes out of its restaurant. 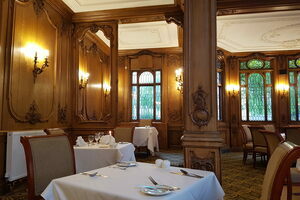 The lounge is in the Louis XV-style based on interiors at the famed Palace of Versailles. However, it has a more British twist, as it uses English oak finishes rather than gilding. This dining room is widely believed to be so similar to the Titanic's that it has been used in films to represent the famous ship. In fact, when now-retired U.S. Navy officer Robert Ballard found fittings around the Titanic wreck, he used the lounge at the White Swan as a reference. You don't have to be a guest at the White Swan Hotel to sit in the dining room for a meal which is a treat since the restaurant is the closest one can get to dining on board the Titanic.